Computer enclosures for security and protection of computer hardware, sealed to IP54 or IP65. Computer enclosures sealed to IP 54. 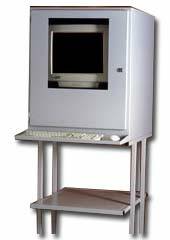 Enclosures to protect PC and computer hardware in industrial and commercial applications, ensuring security of computer and electronic equipment. 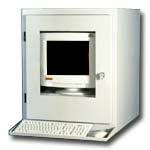 PC Guard have a range of high quality computer enclosures that suit many industrial and commercial applications from mild steel computer enclosures to industrial waterproof stainless steel computer enclosures sealed to IP65. Our Enclosures come with a filtered air supply with positive internal pressure to prevent dust and dirt from entering Sealed doors. It also comes with a Lexon anti scratch and anti shatter window, a 4-Way mains distribution unit and a Epoxy powder coated metal case. Already fully assembled this provides you with the option to instantly start using it. An Optional stand for a printer either enclosed or open is avaliable for you. The front door of the unit is completly lockable as well as the back providing security and easy access. Slim line TFT touch screen PC guard. Supplies protective enclosures for computers, including waterproof computer protection, waterproof keyboards, and sealed computer cabinets. Online marketplace for buying and selling computer enclosures. Offers computer racks, tower cases, and computer enclosures for housing motherboards and rackmount servers. Distributes a broad range of electronic components with a commitment to product quality, availability, service, and performance. Online retailer of network hardware and PC accessories including computer cases.